The movement of the populace is what the poem’s language models. The poem is populated with the Whitmanian multitude, in all of its density, excitement, and political potential. The crowd on the subway might become the crowd in the street, or in the protest. The bodies make it feel possible. A city is a thing you feel, or feel past. It requires the temporal crossgrain of now being a surface that has a private depth formed of all the living you’ve done. It’s a surface that is always coming up against strangers, who exist for you in a now that’s only surface, whose experience just touches yours, and remains mutually depthless. Oppen’s numerousness is a social condition. Living in a city, having a language to talk about it, requires speaking in and as and against a public. White’s dispersal is in the legacies of violence that preclude bodies sharing a street or a subway station from functioning as a public. The ability of White’s speaker to be unified with others is directly foreclosed by those others’ embrace of a position of privilege that makes them complicit in the perpetuation of quotidian racial and gender-based violence. 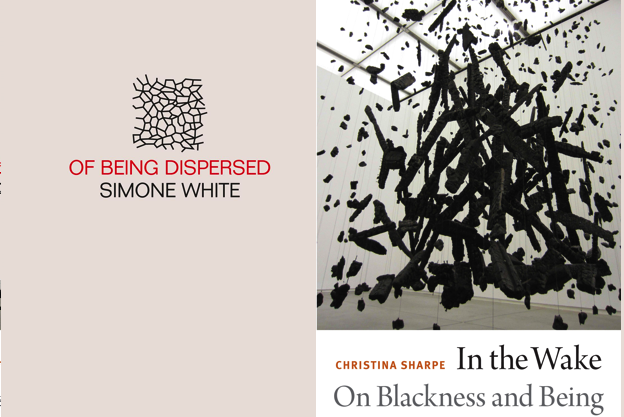 Where White’s poems exceed Oppen, they share the concerns of Christina Sharpe’s 2016 monograph, In the Wake: On Blackness and Being. Sharpe identifies “the wake as the conceptual frame of and for living blackness in the diaspora in the still unfolding aftermaths of Atlantic chattel slavery.” The wake is a spatiotemporal constant, Black being and Black writing occurring always in slavery’s wake. The wake provides a context and method for attending to “the physical, social, and figurative death and also to the largeness that is Black life, Black life insisted from Death.” The wake takes a range of definitions that it spans and shifts multiply between: “the keeping watch with the dead, the path of a ship, a consequence of something, in the line of flight and/or sight, awakening, and consciousness.” Wake work is its analytic, the means by which to try to “continue to imagine new ways to live in the wake of slavery, in slavery’s afterlives.” The condition of dispersal that is the subject of White’s poems is an instance of the wake. White’s poems are written into the condition of dispersal. They thematize and enact the fracture of being a subject that occurs by being variously refused subjectivity. Sharpe writes, “I am trying to find the language for this work, find the form for this work. Language and form fracture more every day.” The poems negotiate fracture via their multiple speakers, or one who has parts, who comes apart. When language and form fracture, they break apart the cohesions that needed them. Intimate relationships and family systems fragment, erode, or are truncated by loss. Neighborhoods and cities rupture or hang together by their dissonance. The form of these poems — declarative in moments and refusing the syntax of narrative writing or speech in others — sits with fracture, the simultaneous holding together and coming apart of the wake. Sharpe writes, “Despite knowing otherwise, we are often disciplined into thinking through and along lines that reinscribe our own annihilation, reinforcing and reproducing what Sylvia Wynter (1994, 70) has called our ‘narratively condemned status.’” The lines of thinking that reinscribe Black annihilation are bound up in the narrative forms in which that thinking appears. But refusal of aspects of narrative forms does not automatically find repair in abstract uses of language. Earlier in the chapter, as Sharpe situates her use of the personal to frame the concept and method of the wake, she uses Saidiya Hartman’s writing on the “autobiographical example” to note, “Like Hartman, I include the personal here ‘to tell a story capable of engaging and countering the violence of abstraction.’” Abstraction’s violence is its disappearance of a subject position from which to refuse. The refusal of both received narration and abstraction is crucial to Black experimental writing that provides a lineage apart from the frequent white collapsing of the nonrepresentational and the avant-garde. Work invested in that refusal includes what Evie Shockley refers to as “innovative” writing by Black poets either misread within or left out of the white experimental tradition, and what Harryette Mullen refers to as poetry “enabled by theoretical discourse and avant-garde practices,” as distinct from “formally innovative” writing. Writing in the wake uses its syntax to negotiate the personal and its fracture. One locus of that fracture is Sharpe’s use of prepositions that model the wake’s relational structures. She writes, “we, Black people everywhere and anywhere we are, still produce in, into, and through the wake an insistence on existing: we insist Black being into the wake.” The wake takes multiple and simultaneous positional relationships: in, into and through. “Wakes are processes,” Sharpe writes. They address the question: “How do we memorialize an event that is still ongoing?” Sharpe’s multiple prepositions suggest that writing in the wake can enact its procedures on the level of the word and its selection. The multiplicity of prepositions draws the process of selecting language into the scene of writing, rather than presenting writing as selection’s result. Abstract use of language in the wake is not a refusal of representation, but a representation of a refusal to couple the personal and the figurative. Sharpe reads the poem as one site of this refusal, as she uses the method of the wake to read the poetry of NourbeSe Philip, Dionne Brand, and other Black writers who engage the fracture of language and form, as White does. The expansive theoretical twisting of “violence is the unit of joblessness” is both pushed against and shredded by the man on West 4th Street. The dispersal is across scale: interpersonal for the speaker and the man, the immediate somatic of mosquito potential, the sociological scale of the poem as reporting, the inability to write about the city as a prospect poem. The poem begins and is variably addressed to the Black journalist Erica Johnson who died in her apartment in 2012. It impels the reader to bang down their wrist like a gavel. It imagines a statue of Emerson as the preservation of his body for public display as though banging him down would shatter the concrete and release him. Emerson looks out over the scene of a man inadvertently defecating into his pants. Neither the man nor the young mothers are explicitly raced in the poem, but both are gendered. The poem negotiates the history of poems and speeches as social records via Wordsworth and Emerson. It moves by spatial and affective associations, by the pair of “ifs” and their single “then,” or by the gaze. Reading White’s poems in the wake continues and extends the work of Philip, Brand, Mullen, Shockley, and many other Black writers to resituate and resist conversations that equate abstraction with experimentality, and also those that equate experimentality with whiteness. As White notes in a 2014 essay on the Poetry Foundation’s Harriet blog, an essay that begins with an account of going to see three white poets read to an audience in which she was the only person of color, “I had been thinking for a long time about what people mean when they say that US poetry that is not interested in reproducing the familiar (call it what you want: experimental, innovative) is a white practice, a white thing, dominated by white poets and white institutions.” One framing of the equation of that practice and whiteness in Language poetry situates experimentation as a political project of refusing the commoditization of language. Charles Bernstein and Bruce Andrews’s introduction to the 1984 L=A=N=G=U=A=G=E Book, a collection of essays and statements of poetics by poets whose work engages with a resistance to representation, asserts, “the project of poetry does not involve turning language into a commodity for consumption.” Many strains of the project of white experimental poetry have been concerned with language as a commodity to the exclusion of the use of that language to justify bodies as commodities. A decontextualized reading of the commoditization of language abstracts the legacies of slavery into disappearance. It is this violence of abstraction that Hartman’s use of the personal, and Sharpe’s after it, refuses and combats. Language and form fracture, Sharpe explains, because of the weight and presence of histories of violence. To read In the Wake, to read White’s poems in the wake, is to refuse the terms of experimental writing that seeks to selectively undo the violence of capitalism by reasserting a white (in its history, usually white, male, cisgender) subject position. To read in the wake is to take the decontextualization of that subject position as itself a form and method of a violent reinscription of power. White’s title poem shifts scales to keep moving, reflects on its mode of composition to note its ongoingness. It remembers a man with a book on boats, and recurs, comes back to them. It uses the poem to work out how to write it. It names its structure. Its structure is boats and their movement, and bespoke, modified by being written into their wake. 1. George Oppen, Of Being Numerous (New York: New Directions, 1968), 11. 3. Simone White, Of Being Dispersed (New York: Futurepoem, 2016), 41. 4. Christina Sharpe, In the Wake: On Blackness and Being (Durham, NC: Duke University Press, 2016), 2. 16. Simone White, “Flibbertigibbet in a White Room / Competencies,” Harriet Blog: The Poetry Foundation, April 16, 2014. 17. Charles Bernstein and Bruce Andrews, “Repossessing the Word,” in The L=A=N=G=U=A=G=E Book (Carbondale, IL: Southern Illinois University Press, 1984), x.